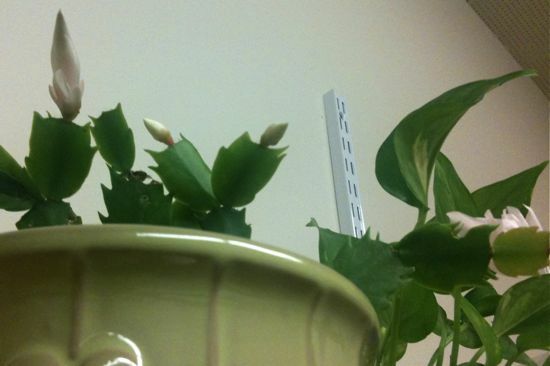 Last spring a Christmas cactus died slowly from neglect in one of our bathrooms. In late May, in a flurry of post-semester cleaning and organizing, I moved the pot with the petrified soil and dessicated leaves out to the back steps. I wondered if the roots of the plant, soaked by whatever rain should fall, would sprout a new plant. And, if not, I could toss it into the nearby compost. The pot hid among some other more viable planters all summer. It was only two weeks ago, when I brought in the plants in advance of the Halloween snow, that I noticed it was alive again. Not a new sprout — the old thing, alive. I brought it to work and proceeded to lose track of it again. (Why do I do this?) 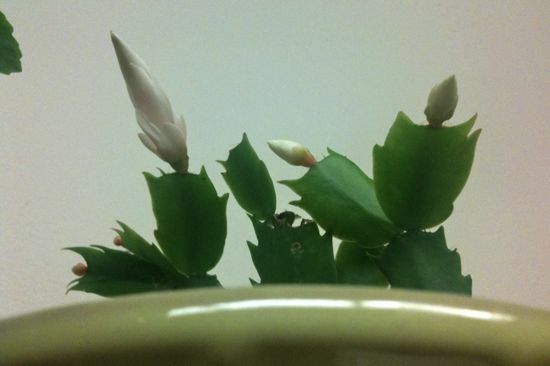 Thursday night, on the way out the door for the three-day weekend, I reached up to water the Kalanchoe and Pothos and noticed that the cactus, hiding again behind the two bigger plants, had… blossomed. Perhaps all the time I had believed myself to be making mistakes with the cactus I had been doing exactly what it needed, and what it didn’t. Are those... could they be... buds? 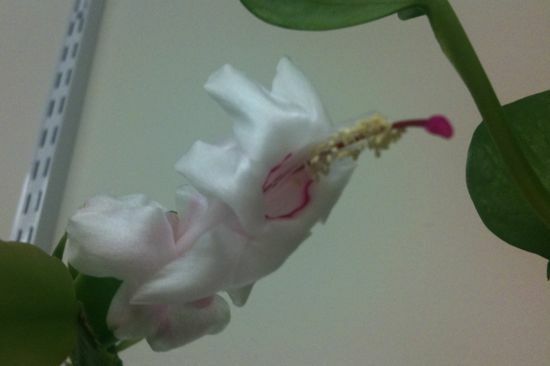 I have never ever my Christmas cactus bloom. What’s the trick? More sun. More cold. I accomplished this accidentally. Maybe your apartment is too dark and too warm? Bring it to work and put it in a cold bright window. I always put mine out on the side porch when I think there won’t be a hard freeze again, and then I forget about it, and it is very happy. Right now it’s still outside and covered with buds ready to bloom. As soon as I bring it in, it’ll pop. Indoors it only gets watered when I happen to be holding some extra water and wondering what to do with it. This plant loves benign neglect.